An interesting design challenge in early view cameras was to figure out a way to reposition the ground glass frame for portrait (vertical) or landscape (horizontal) orientations. 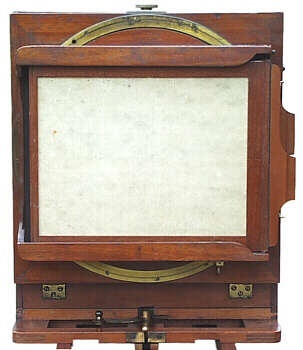 The earliest cameras had large square ground glass assemblies that held plates in either position. Another approach was to simply turn the entire camera onto its side -- which was somewhat impractical considering the size of most view and field cameras. In 1882, E.& H.T. Anthony attacked the problem by creating a novel rotating back/bellows design - refer to the Anthony's Phantom Camera page. To avoid possible patent infringements with Anthony, The American Optical Company used two designs by Mathias Flammang. Both designs were assigned to the Scovill Manufacturing Company for exclusive use on their photographic apparatus. Flammang's first design was a simple reversible back. The ground glass frame/mount was removed from the camera back, rotated 90 degrees, and reattached. The reversible back required a larger square shaped rear standard and was featured on cameras such as the St. Louis Reversible Back Camera and other models. Flammang's second design, an integral (non-removable) back that rotated on the rear standard, was originally offered by the American Optical Company on Flammang's Patent Revolving Back Cameras. The rotating back was patented on August 21, 1883 (patent #283,589) and also found on Scovill's Revolving Back (field) and Empire Portrait (studio) cameras. As a note, cameras made by the Scovill Manufacturing Company for the American Optical Company had a higher quality finish and were more expensive. Flammang's Patent Revolving Back Camera included a canvas bag and made in standard formats from 4 x 5 inches to 25 x 30 inches. Considering the large size of this whole-plate camera (15" high x 18-1/2" deep x 11-1/2" wide), I suspect that the 25 x 30 inch model must have been merely enormous -- probably the size of a small tool shed. The double swing model shown here sold for $45 in 1888. This was a very expensive camera at the equivalent of $853 in year 2000 dollars! 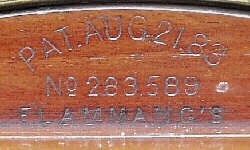 Above: Flammang's 1883 patent is impressed into the wood above the plateholder and below the brass rotating ring. Left: View of Flammang's patented revolving back. The large brass lever at the bottom of the camera unlocks the sliding back for focusing. A small brass knob (above the center rail) locks the second back swing. Flammang's cameras were offered in front and rear focusing body patterns. The Flammang's camera on this page is a fine example of the rear focusing pattern in the whole-plate (6-1/2 x 8-1/2 inch) format. Other than the patented revolving back feature, the body is nearly identical to Scovill's New Reversible Back Acme View Box. 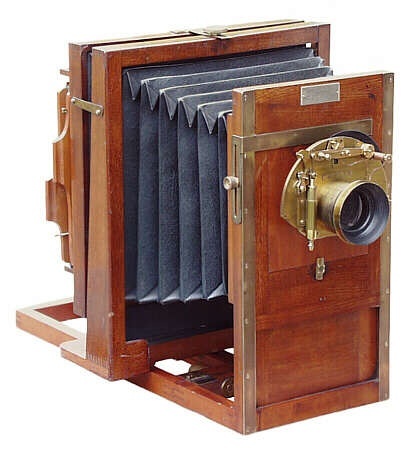 The camera has a Prosch Triplex shutter with unmarked rapid rectilinear lens, mahogany body, brass trim and cloth bellows. The lighter color wood finish and bottom mounted back tilt may indicate that this is an early model, c1885. An unexpected bonus was also found on the camera. The name L.B. Kirsten, Pho. is impressed into the wood under the front standard - most likely the owner of a small studio or an amateur photographer operating in the eastern part of the United States. Since I am interested in uncovering the original owners of cameras in the collection, please feel free to contact me regarding any information on Kirsten (including images).